Diabetic foot problems need special attention by your podiatrist. From getting a diabetic neurovascular foot assessment, to getting clarity and education, through to planning regular diabetic foot care. 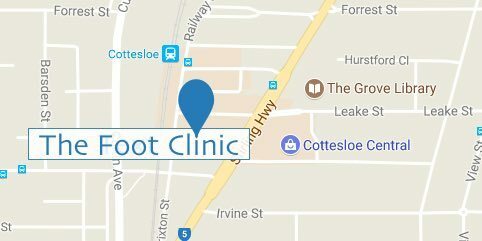 At The Foot Clinic Perth (Cottesloe Central), we are dedicated to helping you maintain the happiest feet possible, if you suffer from diabetes. Diabetic foot problems are linked to poor blood circulation and nerve degeneration. If you have diabetes, you may have a loss of circulation in your feet, and lose sensitivity in those areas because of degenerated nerves. This means that your body is less competent to deal with infections, and at the same time you lose sensation. So as you get injured, or as a healing process takes longer, you may not be aware of the diabetic foot problems you experience. This is why diabetic foot care is so important. Skin and nail problems are common foot conditions. We offer podiatry procedures and treatments for ingrown toenails, fungal nails, corn and callous, warts and plantar warts. Diabetic foot care is crucial, because of the risks of complications in your feet, as a diabetes patient. At the Foot Clinic, we have a particular expertise in foot health, and we can help you with the whole range of diabetic foot care. Diabetic foot problems commonly account for hospital admissions in diabetes patients. This is because of the many complications to foot problems that may occur, if you suffer from diabetes. As a diabetes patient, there are many things you can do yourself. It’s a good habit to check your own feet daily, for cuts, blisters, bruises or any signs of injury. You may never have felt the actual injury. If you are not in a position to check your own feet, find someone to check your feet on a daily basis. This is essential to prevent more serious complications. To avoid injuries, wear the right shoes, so they don’t rub against your feet, and practice proper foot hygiene. Your podiatrist will also recommend you do a Diabetic Foot Assessment and/or a Neurovascular Foot Assessment, on a regular basis. Inform your podiatrist about any past surgeries or ulcers, history of poor blood circulation, smoking habits, and other symptoms like leg or foot pain. The Neurovascular Foot Assessment we perform will check your blood flow and nerve supply, and will identify any areas of risk. At The Foot Clinic, our experienced and friendly podiatrists will help you with a treatment plan that plans for your routine visits. This is the best way to prevent more serious diabetic foot complications, such as ulcers and infection. We will examine your feet, trim or thin your nails, treat any blisters so they don’t become ulcers and infections, and educate you on the diabetic foot care you can apply at home. We build better bodies, from the feet up. By helping you with your diabetic foot problems, we are committed to helping you maintain the best possible foot health, so you can go about your daily life in the best possible way.